Croquetas are one of the most popular dishes in my restaurants. I spent ages perfecting this recipe. Usually the roux is made with butter, but I use olive oil because I think it gives a better flavour. If you’d rather not use smoked salmon, you could substitute with cubed Ibérico ham, which you can often buy in Spanish delis and is ideal for this recipe. 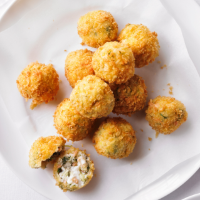 Croquetas are a bit of a fiddle to make, but they can be frozen and make great party food, so have a go. 1 Heat the oil in a pan until it starts to shimmer, then add the leek and sauté until soft but not coloured. Fry for another minute, then stir in the flour and fry over a medium heat for about 5 minutes, until the mixture is golden but not burnt. It is important that the flour is cooked properly or the croquetas will taste of flour. 2 Combine the stock and milk in a small pan and heat until hot but not boiling. Season the liquid with a few scrapes of nutmeg. Gradually add the liquid to the roux, a few tablespoons at a time, stirring the mixture constantly. in the fridge for an hour. 4 When you are ready for the next stage, line up three bowls: one with the flour, the other with the beaten egg, and the third with the breadcrumbs. 5 Take the salmon mixture out of the fridge. Dust your hands with flour, make a ball with the mixture and roll it between your palms. The size of the croquetas is up to you, but the easiest is a walnut-sized ball. Next, dunk the croqueta into the flour – you want a dusting – followed by the egg and then the breadcrumbs. Put the croquetas on a tray and when you’ve used up all the mixture, put them all back in the fridge for 30 minutes. 6 If you have a deep fat fryer, heat the oil to 175°C/325°F and fry the croquetas for a couple of minutes. If not, heat the oil in a frying pan until it starts to shimmer, then add 3 or 4 croquetas at a time and fry until they are golden all over.